She was a New York socialite, Ralph Lauren publicist and married to 1988 People’s Sexiest Man Alive – John F. Kennedy Jr. Yes, it seems like Carolyn Bessette Kennedy had a lot of admirable aspects in her life. Not that she needs any of them to be admirable, her chic yet simple style does that for her. She had the unique ability to be classically stylish while being ahead of her time. Her style is the perfect expression of minimalism: you still want to wear those outfits today. It’s the type of style that you can’t fake or copy out of a magazine. Reflecting her mind, her taste and way of life. That is why years later, she still has the same mysterious and modern look to her. Even though her outfits are dated decades ago, she succeeds in being up-to-date like nobody else. Michael Kors marked her style ‘throwaway chic’, referring to the effortless way she dressed which described exactly what made her look so appealing. They met in 1994, John-John Kennedy and Carolyn Bessette. Both jogging at Central Park, they saw something in each other, something the whole world also saw in each of them. She was nicknamed ‘The Look’ at Calvin Klein, for her flawless and on-point sense of style and beauty. He was the son of the former American president and Jackie Kennedy, a woman who reminds of Carolyn in her classic and strong look and personality. Suddenly thrown into the spotlight by dating JFK junior, Carolyn Bessette tried to avoid the media at all costs. In contrast to John, she was not used to the constant attention that came with being a Kennedy. They married in secret on the beach of Cumberland Island, Carolyn wore a Narcisso Rodriguez dress that had more of a slip dress than an actual wedding gown and Manolo Blahnik stilettos. That was a rebellious act in itself, wearing a slipdress at your wedding was not something that was done at that time. Carolyn set a huge statement with her sleek and simple wedding look, super cool as she always was. Till this day, women are still referring to themselves as ‘the Carolyn Bessette-Kennedy bride’ inspired by Carolyn’s minimal wedding dress. Ironically, Carolyn’s simple outfits and aversion for being the center of media attention made her a magnet for that attention. It was her not trying at all that made her more appealing. That, and her outfits that also were strong in their simplicity, the beauty was in the shape and the silhouette. It was not about expensive labels and shiny jewelry, her outfits made her more beautiful. It seems like she understood that very well, what shapes and classic pieces made her shine in simplicity. That kind of dressing also made her super classy and intelligent, the ultimate cool woman. The reason why Carolyn Bessette-Kennedy is still a 90s one woman fashion cult today. Despite Carolyne’s attempts to keep a low profile, her and John became New York’s Golden Couple. How could they not? He was everything America wanted from the heir to the Kennedy thrown. Studied to be a lawyer, made a name for himself with his glossy magazine George, and was as highly charismatic as you would expect from a Kennedy. And she was his magnetically beautiful wife that also showed a lot of similarities with his mother Jacky Kennedy. They embodied the perfect New York high society image. But not without some weak spots. There were rumors that Carolyn could not handle life under the constant media pressure which led her to cocaine use and violent outrages. Even so, no one doubted that their relationship was full of passion and deep love, it shines through from every picture ever taken of them. 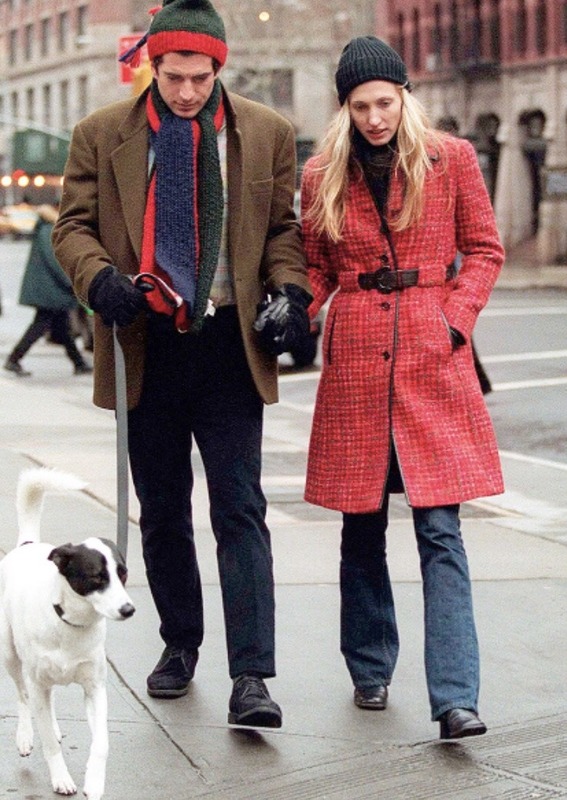 How to Copy the Carolyn Bessette Kennedy Throwaway Chic Look? Because she is still as mesmerizing as she ever was on the photographs from decades ago. And her style is so timeless, we can easily say as timeless as they come. She definitely perfected the 90s minimal look. But what is the key to those ensembles, and how can we get them? This made her stand out in her time. She was a true pioneer in that sense, staying true to her own style. Choosing simple and elegant on her wedding day above trying to be the center of attention as everybody else was doing. This made her a true street style star prior to the internet age, but also still relevant in the internet age.